Photograph album containing 77 annotated, black and white photographs of the construction, building, launch and trials of S.Y. Discovery. Compiler of this album unknown but obviously someone very closely connected to either the expedition or the construction with photographs annotated with detailed descriptions and poems. Mainly amateur photographs although does include some professional photographs, taken by Valentines of Dundee. Photograph shown is taken from the launch of the ship in Dundee on 21st March 1901. 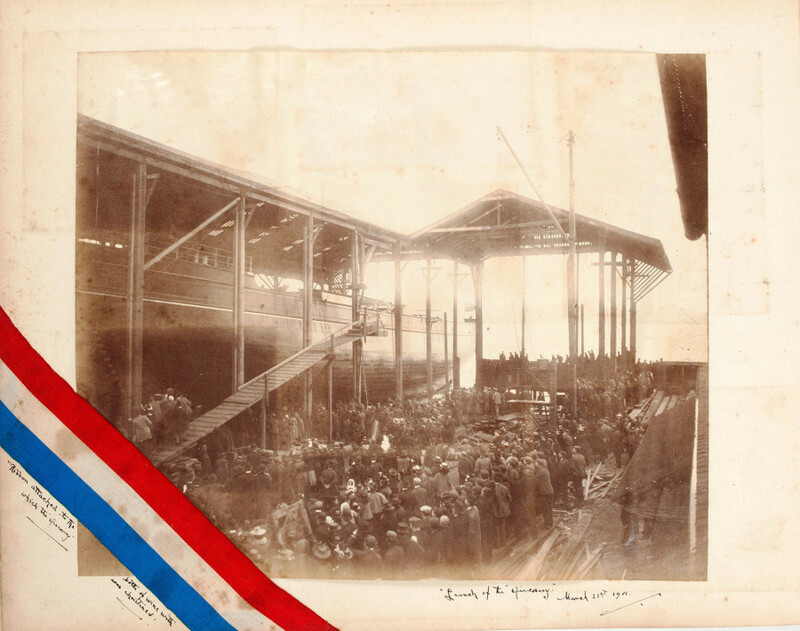 The photograph is overlaid with a piece of ribbon tied around the bottle which Lady Markham (wife of Clements Markham, patron of the expedition) used to christen the ship.